Winning 52% of your total points makes you number one. In the last article (Click Here) I talked about how I adapted my game to win matches in NTRP and seniors tournaments. Although I was successful, won a couple of tournaments, and was ranked in several divisions in Norcal, there were plenty of players I couldn't or didn't beat, including a few that stood out as lost opportunities, and losses I tried to learn from. These were all essentially mental and emotional breakdowns. I suspect many of our subscribers have had similar experiences. Remember in a close match, the winner might win only a handful more total points. 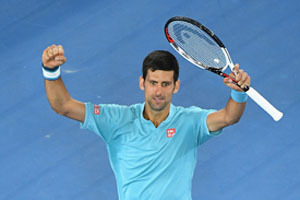 When he was number one in the world, Novak Djokovic led the tour by winning 52% of his points. So here are some examples of close matches I played that went the other way and why I think they did. In my first year of playing NTRP tournaments, I got to the semi-final of a 4.5. The two guys in the other semi I knew and had actually beaten. I also had seen the guy I was playing and knew I could beat him.